RALEIGH, N.C. - March 15, 2019 - PRLog -- The United States Power Squadrons® (USPS) continues the debut of its third season of safe-boating videos on America's Boating Channel™ with "SAFETY TIPS FOR PADDLE SPORTS," which can be found online at americasboatingchannel.com and as a free mobile app available at Apple's App Store and Google Play. 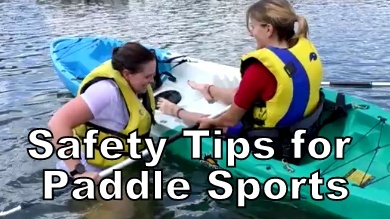 The new "SAFETY TIPS FOR PADDLE SPORTS" (https://youtu.be/tLNfnbin7ag) video shows tips for safe enjoyment of recreational paddle-boating in kayaks, canoes, and similar vessels under oars. The "SAFETY TIPS FOR PADDLE SPORTS" video is also being distributed by America's Boating Channel through popular social media including Facebook (https://www.facebook.com/americasboatingchannel/), Twitter (https://twitter.com/AmericasBoating), and YouTube. America's Boating Channel is now releasing a new safe-boating video every Friday as most Americans prepare for the recreational boating season. America's Boating Channel is produced under a grant from the Sport Fish Restoration and Boating Trust Fund administered by the U.S. Coast Guard. The United States Power Squadrons is the premier boating organization dedicated to "Safe Boating through Education" since 1914. USPS is America's Boating Club® -- For Boaters, By Boaters™. America's Boating Club is a registered trademark of the United States Power Squadrons. America's Boating Channel has as its partner BoatUS and is cosponsored by Discover Boating with a contribution from Weems & Plath. As an America's Boating Channel Partner, the Boat Owners Association of the United States (BoatUS) has been looking after the interests of recreational boaters since its founding in 1966. As an America's Boating Channel Sponsor, Discover Boating is a public awareness effort managed by the National Marine Manufacturers Association (NMMA) on behalf of the North American recreational boating industry. As an America's Boating Channel Contributor, Weems & Plath offers the SOS Distress Light, an LED visual distress signal device that meets US Coast Guard requirements to replace traditional pyrotechnic flares.